As my listeners know, conditions in mortgage markets remain quite difficult, and mortgage delinquencies have climbed steeply. The sharpest increases have been among subprime mortgages, particularly those with adjustable interest rates: About one quarter of subprime adjustable-rate mortgages are currently 90 days or more delinquent or in foreclosure.1 Delinquency rates also have increased in the prime and near-prime segments of the mortgage market, although not nearly so much as in the subprime sector. As a consequence of rising delinquencies, foreclosure proceedings were initiated on some 1.5 million U.S. homes during 2007, up 53 percent from 2006, and the rate of foreclosure starts looks likely to be yet higher in 2008. Not all foreclosure starts result in the borrower's loss of the home; sometimes the borrower is able to make up the missed payments or other arrangements are made with the lender. But, given the number of borrowers in distress and the weakness of the general housing market, the share of foreclosure initiations that ultimately result in the loss of the home seems likely to be higher in the current episode than customarily has been the case. 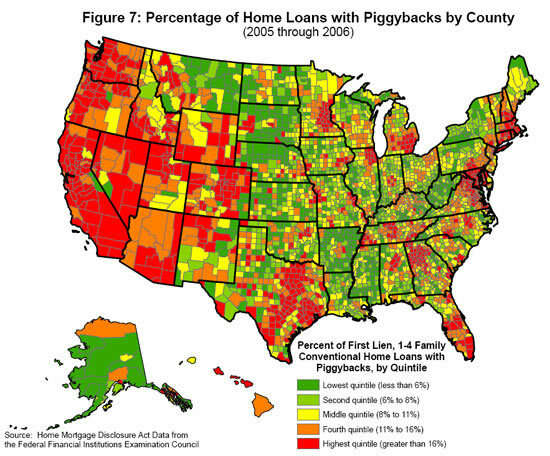 On the principle that a picture is worth a thousand words, Federal Reserve staff, using detailed, county-by-county information on mortgage performance, have developed a series of "heat maps," which summarize the incidence of serious mortgage delinquencies across the nation as well as some of the key drivers of loan performance. As the examples will make clear, the figures use warmer colors--orange and red--to show counties for which the factor being considered has a higher value or change. Lower values or changes are indicated by cooler colors--shades of green--and yellows indicate areas where the factor under consideration has a moderate value or change. Nationally, as of the fourth quarter of 2007, the rate of serious delinquency, as measured by credit records, stood at 2 percent of all mortgage borrowers, up nearly 50 percent from the end of 2004.2 The fourth quarter of 2004 is a useful benchmark, because general economic conditions were fairly normal and the lax underwriting that emerged later was not yet evident. 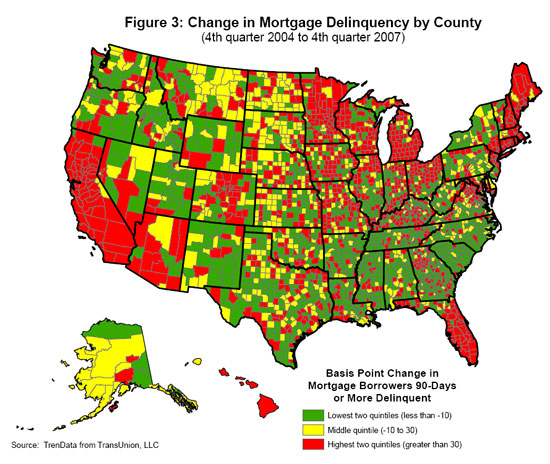 Figure 1 shows the national patterns of serious mortgage delinquency in 2004, which, again, I am taking as representative of a relatively normal period, with orange and red indicating the highest rates of delinquency and greens indicating the lowest. In 2004, the areas of the country with the highest rates of serious delinquency included significant portions of the Southeast; parts of the Midwest, most notably Ohio and Indiana; portions of the Rocky Mountain region; and Texas, Oklahoma, and areas in the Mississippi valley. In contrast, many parts of the country experienced exceptionally good loan performance at that time, including most of the West Coast, New England, and much of southern Florida. However, conditions in some areas changed greatly in a relatively short period of time. Figure 2 shows the pattern of delinquency rates as of the last quarter of 2007. Many of the areas that exhibited elevated delinquency rates in 2004 continued to show relatively high rates of delinquency in 2007. But some areas that had low rates in 2004 experienced high rates three years later. Figure 3 makes this point more sharply by showing the pattern of increases in delinquency rates between 2004 and 2007, with the largest increases shown in red. The strong regional pattern is evident in the figure. Although many parts of the country have seen significant increases in mortgage delinquencies and foreclosures, a number of areas--such as California, parts of Nevada, Arizona, Colorado, Florida, portions of the upper Midwest, and New England--have been particularly hard hit. The regional pattern of the recent rise in mortgage delinquencies and foreclosures requires explanation. Again, we can use heat maps to examine the underlying relationships across geographic regions between changes in mortgage delinquency rates and factors identified as driving loan performance. For example, the change in the unemployment rate in a county can be used as a proxy for disruptions in family incomes and subsequent financial stress. Figure 4 shows changes in average annual unemployment rates across counties between 2004 and 2007, with counties indicated in red experiencing the largest increases in joblessness.3 The data suggest that increases in unemployment rates account for at least some of the recent increases in mortgage delinquencies. Parts of New England, states in the Great Lakes region--including Minnesota, Michigan, and Wisconsin--and a number of other states, such as Nevada, show both increased mortgage delinquencies and notable increases in unemployment rates. However, the behavior of unemployment does not seem sufficient to explain the increased delinquency rates in other areas, including California, Florida, and portions of Colorado, where mortgage delinquencies increased during a period in which unemployment generally decreased. 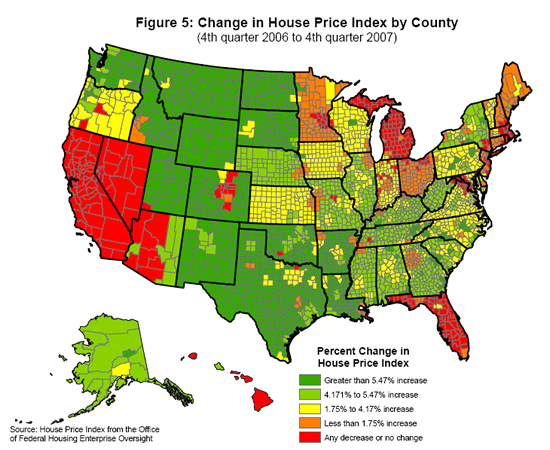 Another important determinant of loan performance, identified by research at the Federal Reserve and elsewhere, is changes in house prices.4 Figure 5 shows the regional pattern of changes in house prices between 2006 and 2007, with the sharpest price declines indicated in reds and oranges.5 The figure shows that Florida, California, Nevada, Michigan, and parts of New Mexico and Colorado experienced decreases in house prices between the fourth quarter of 2006 and the fourth quarter of 2007 (a pattern which has continued and intensified in 2008).6 As I noted, sharp declines in house prices, and thus in homeowners' equity, reduce both the ability and incentive of homeowners, particularly those under financial stress for other reasons, to retain their homes.